Want chocolate? Here is a double helping in a box of 50! 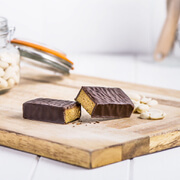 A delicious diet bar with a light chocolate filling, tiny caramel pieces enveloped in a layer of real milk chocolate. Our bars are specifically formulated to be high in protein and enriched with vitamins and minerals containing a 3rd of your daily RDA. 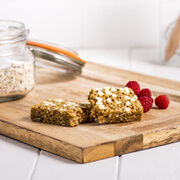 Use our diet bars daily as a meal replacement if you are following a low calorie healthy diet plan, or consume 3 to 4 products per day alone (as directed), for your full daily RDA intake as part of an Exante Diet fast weight-loss meal plan. If you are thinking of following an Exante Diet meal plan, we advise that you should always check your eligibility via our BMI tool and read our terms and conditions closely. Protein Blend (Soya Protein Isolate (Soya), Hydrolysed Whey Protein Isolate (Milk), Milk Protein Isolate (Milk), Whey Protein Concentrate (Milk) Emulsifier: Soya Lecithin (Soya), Fructo-Oligosaccharide, Humectant (Glycerine), Milk Chocolate Coverture (13%) (Sugar, Cocoa Butter, Whole Milk Powder (Milk), Cocoa Mass, Emulsifier: Soya Lecithin (Soya), Flavouring), Water, Glucose Syrup, Sunflower Oil, Di-Potassium Phosphate, Fat Reduced Cocoa Powder, Flavourings, Di-Magnesium Phosphate, Sodium Chloride, Caramel Pieces (Sugar, Butterfat (Milk), Non-Hydrogenated Vegetable Fat (Palm), Whole Milk Powder (Milk), Skimmed Milk Powder (Milk), Salt, Soya Lecithin (Soya)), Tri-Calcium Phosphate, Vitamin & Mineral Blend (Sodium Ascorbate, Maltodextrin, Ferric Pyrophosphate, Vitamin E, Nicotinamide, Zinc Oxide, Acetate, Calcium D-Pantothenate, Sodium Fluoride, Manganese Sulphate Monohydrate, Potassium iodate, Vitamin B12, Chrome Chloride, Folic Acid, Vitamin D3, Sodium Selenite, Copper Citrate, Pyridoxine Hydrochloride, Thiamine Hydrochloride, Vitamin K1, Riboflavin, Sodium Molybdate Dihydrate), Sodium Bicarbonate, Ascorbic Acid, Vitamin B6, Sweetener (Sucralose), Antioxidant (Mixed Tocopherols). I did not care for the taste of the Exante double chocolate bars...they had a vitamin aftertaste. Tried these for the first time today and I was very pleasantly surprised. I don't usually like chocolate but this was very nice and also very filling. It takes some chewing to get through it as it is quite dense (in a good way). I will definitely buy again ! 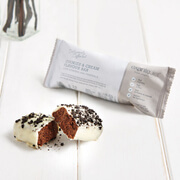 They taste like dense brownies, it is pleasant for a diet bar and I will definitely order these again. Maybe the texture could be improved a little, but otherwise these cannot be faulted. I had a box of 50 of these, so a long way to go. I was so suprsied by these bars! I expected them to lack flavour due to this being a low cal diet but how wrong was I! Eating these bars doesn't even feel like a diet, it feels like I'm cheating. You can even microwave them too and make delicious chocolate brownies. The best product for all us alcoholics out there!